Hello Taxpayers , as preparation and submission of income tax returns have been started which starts making a mind boggling effect to many individuals, what to do and how to do? 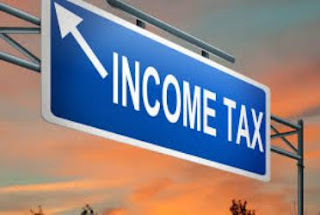 But the matter is not so tough or blasting as it seems, but a person must have to take precautions and follow the guidelines, rules, provisions and instructions prevailing under Income Tax to correctly follow the procedure of filling income return. Who will and when to file the return of Income? Every resident of India (excludes NRI) having any asset including any financial interest in any entity located outside India or singing authority in any account located outside India, is required to file a return of Income whether or not he has any income chargeable to tax. 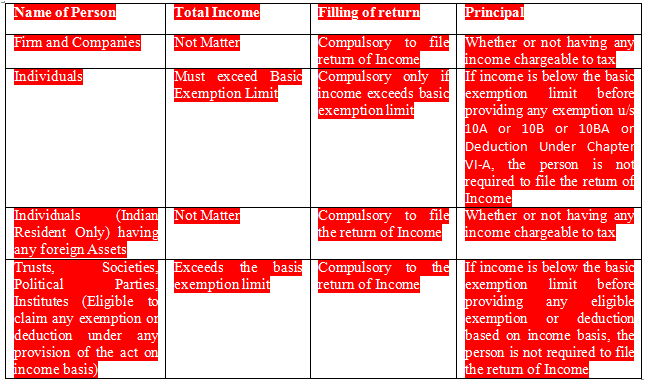 They will furnish the return of income only if before availing any Exemption Under Section (u/s) 10A or 10B or 10BA or Deduction Under Chapter VI-A, their income exceeds the maximum amount not chargeable to tax. Nil , if there is loss. Section has no specific amount of exemption, it is provided based on receipts and expenditure. Chapter VI-A provides list of various deductions such as Section 80C or Section 80D, claimed as deduction by the assesse while calculating his total income. Loss Return Section 139(3) If any person who has sustained a loss in any previous year under the head "Profits and gains of business or profession" or under the head "Capital gains" and claims that the loss or any part thereof should be carried forward under sub-section (1) of section 72, or sub-section (2) of section 73, or sub- section (1) [or sub-section (3)] of section 74, [or sub-section (3) of section 74A], he may furnish, within the time allowed under sub-section (1) , a return of loss in the prescribed form and verified in the prescribed manner and containing such other particulars as may be prescribed, and all the provisions of this Act shall apply as if it were a return under sub-section (1). Meaning: A loss sustained by the Assesse in any previous year under the head Business and Professions, Speculative Income, Capital Gain or Owing and Maintaining Race Horses can be carried forward, only if the return of income (return of loss earned) is furnished within the time allowed. However the provisions is silent about the carried forward of Depreciation Loss u/s 32(2) and carried forward of House Property Loss u/s 71(B), so they can be carried forward even if the return is filled late , but it should be filled to gain the advantage of carried forward of loss. Meaning: This provision is applicable to the person who has not furnished the return of income within the time allowed us/139(1) or in response to notice u/s 142(1). 1. · Expiry of one year from the end of the relevant assessment year. For example: If the year is 13-14, then its assessment year will be 14-15. And one year from the end of assessment year means – Return can be filled till 31st March 2016. Any return filled after the time period allowed u/s 139(4), shall be considered as no return is filled. Meaning: The provisions is applicable to the person who wants revise the income tax return. The new file return will replace the return filled earlier. If a person observes that after filling his return of income, he has omitted or missed any information which is required to be filled but missed, then he may file the revise return to replace the existing return. A return will be said defective only if it does not contain any important information regarding Identitiy of Person, Income of Person, Tax payable by Person or other information as considered necessary under the Income tax provisions to be submitted by the assesse. · Correctly Calculate the Total Income for the year.